Friends Home Stay Agra i Agra, India: Bestill nå! 1. Our reception is 24 hrs. If you are coming late, do not worry someone will always there to check you in . Please have your original ID proof (Passport/voters ID/Adhar card/Driver’s license) ready to speed up the check in process. You will not be allowed to check in if you do not have any of the above ID proof. 2. Our check-in time is 12 PM and check-out time is 10 AM. Hey, if you come a little early, our common area is more than equipped to handle your luggage and keep you entertained. Use our free Wi-Fi or games to relax. You can also drop your bags and go out visit the city, we will keep eye on the bags. 3. You may enjoy your stay at a stretch up to four weeks. You may return to enjoy your stay at our property again after a week. 4. In order to cancel or amend your booking you need to contact us. Reservations that are cancelled at least 24 hours prior to check in time are not charged for, whereas no shows or failing to cancel in excess of 24 hours will incur a charge for the first night. 5. Any booking qualifying as group booking (booking of 4 or more people) is liable for a 7 days cancellation policy and a link will be sent out you to make the payment in advance . 6.If you are local resident of the city, you will not be permitted at the hostel. 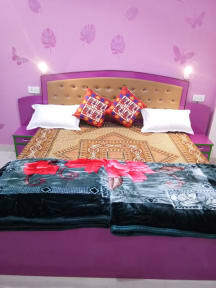 Welcome to Friends Home Stay Agra. 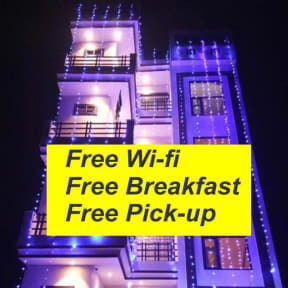 If you've been searching for affordable accommodation in Agra then look no further. We offer a great budget alternative, with clean, comfortable privates rooms and all this is only 2.00 km from the Taj Mahal ticket office eastern gate. We have 3 floors in this building plus nice terrace roof top. We have all rooms with private bath with full furnished new furniture. Wi-Fi access everywhere in this building. We have free breakfast, cooking classes, Heena class and other day tours.